TriWest Healthcare Alliance is a privately held company based in Phoenix and contracted by the Department of Defense (DoD) to administer the TRICARE program in the 21-state West Region. ORAFOL Americas, a subsidiary of ORAFOL Europe GmbH, is a leading manufacturer of pressure-sensitive graphic, printing, and reflective films used in signage, screen printing, digital imaging, and traffic & safety applications. The facility is one of the most modern of its kind in the United States. ORAFOL Americas also markets a wide range of industrial tapes manufactured in ORAFOL Europe’s nearly 2 million square foot facility located in Oranienburg, Germany. 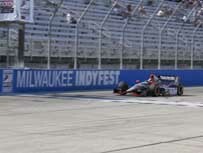 Check out photos from last weekend's IZOD IndyCar Race from Milwaukee! !